Leica Mirrorless - How Does It Rate As A Mirrorless System? - Part 2 - Leica T as a 'hybrid' camera. The only point I'm trying to make with the above comparison is that the Leica T (Typ 701) system is designed, as are most Leicas, to be small and light. And you may argue that some of the Fuji X lenses are faster and with a larger focal range, but for my uses the Leica T options are fine. Both these cameras have 16MP sensors and both have APS-C sensors. Considering that the Leica system is actually more solid , with more metal in it's construction and from my experience more robust, you may consider, as I do, that this shows Leica's design abilities. It's very rare that I take out a whole system with me on my travels, but the Leica T system is an exception. I often go out with all four lenses. It also works very well as a carry anywhere camera for grabbing some video as well. I've written about this often and it's a very neglected part of what the Leica T (Typ 701) offers. Now I'm not going to pretend that this is state of the art 'mirrorless' video quality, it isn't. However having just got myself an Apple TV box and viewing my Leica T videos on my large flatscreen TV, the difference between how the videos look compared to the footage from other more highly regarded cameras is not as great as you might imagine when you look at them close up on a computer screen. Plus the T has one outstanding feature for video. 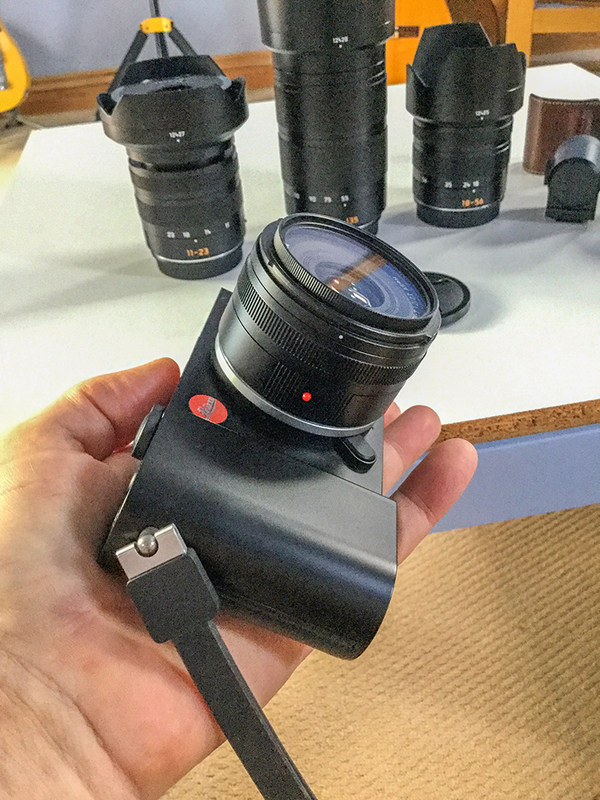 With no IBIS or lens IS, the Leica T produces amazing hand held video footage. using in camera software, very similar to what the stabilisation feature in iMovie does. As you can see from the sample below, it does it very well. Every bit as good as what I was able to get from my Olympus OM-D E-M5 II. For hand held video footage this is very steady and surprisingly so from a camera manufacturer for whom, up to the release of the SL, didn't really take video particularly seriously. But in this and my last article about Leica, I've tried to demonstrate that current Leica's are in fact very useful for shooting 'off the cuff' hand held video. And in situations where something turns up that I hadn't planned it's very simple to press the red video button on the T, safe in the knowledge that with a wide angle lens I'm going to get some good looking stable footage. And in fact the T works better for me in this regard than my Panasonic GX8 for example. Now Leica aren't going to be promoting the T as a hybrid powerhouse anytime soon, but it is a lot more versatile camera than it's given credit for. And while most of the discussion around the T has been about the price and the non-headline grabbing specs., it's important to point out just what it's good at. I would also mention that it has a software stabilisation system for stills as well, which again is actually very good. The Leica Q (Typ 116) has some kind of IBIS (probably via Panasonic) but I've never encountered the software stabilisation system that is in the T before. I can offer no answer as to where it comes from. As far as I'm aware Panasonic have no involvement with this camera, certainly I've never used anything like this on a Panasonic (or any other for that matter) camera. I've always thought it could be seriously developed for cameras. After all, how many of us shoot broadcast quality video? I know I don't. There are a couple of other things I should mention about the T. Again, as a unique feature, the add-on EVF has GPS built-in. Now how useful you think that is, only you can answer. But a lot of my picture libraries are now adding this to their files on their website. The latest firmware has also improved the speed of the AF and made the touchscreen more sensitive and responsive. And finally Leica seem to be re-promoting the system again in the wake of the recent SL, which shares the same T-Mount, announcement. It is now slightly cheaper, though not by much it has to be said (But then this is a Leica and they don't do cheap!!) This is of course in direct contradiction to most of the 'propaganda' that some sites have been putting out, claiming that Leica would 'bury' the system. Well, I couldn't say for sure, but Leica have never done that in the past and I was pretty certain that what has actually happened would happen. That Leica would use the SL announcement to firstly release the new firmware, then announce two new faster lenses (though since it will be a year since both appear, so I'm not holding my breath!!) and use the opportunity to attempt to put some new impetus behind what is after all, now part of a lens-mount system. And if more people get to at least consider the Leica T then that is a good thing. It is still my favourite camera to use and create images with and I will continue to write about it and my enthusiasm for the whole concept in the coming months. Make no mistake it is different and getting used to the lack of external controls seems still to be a step too far for many. But in some way, shape or form, this has to be (or should be) the eventual evolution of where mirrorless / E.V.I.L / CSC and smartphone cameras end up as they move ever closer together. To achieve any kind of 'breakthrough' though, something like this has to come from a bulk manufacturer able to present something like this at a much cheaper price point. Now this may be my fantasy or it may well become a reality, who knows, but I suspect I'm not alone in hoping that something like this does see the light of day. It's about time we returned retro design to from where it came and move on. Because for me looking forward is always preferable and nostalgia isn't what it used to be.